What would you do if a big hairy bug landed on your hand? Smash it? Flick it off? Hop and and down, flail your arms, and make loud high pitched noises? Well, you COULD do one of those things. OR, you you could lift your hand slowly toward your eyes, examine the minute details of the bug’s multi-faceted eyes, and admire the design of its predatory body. 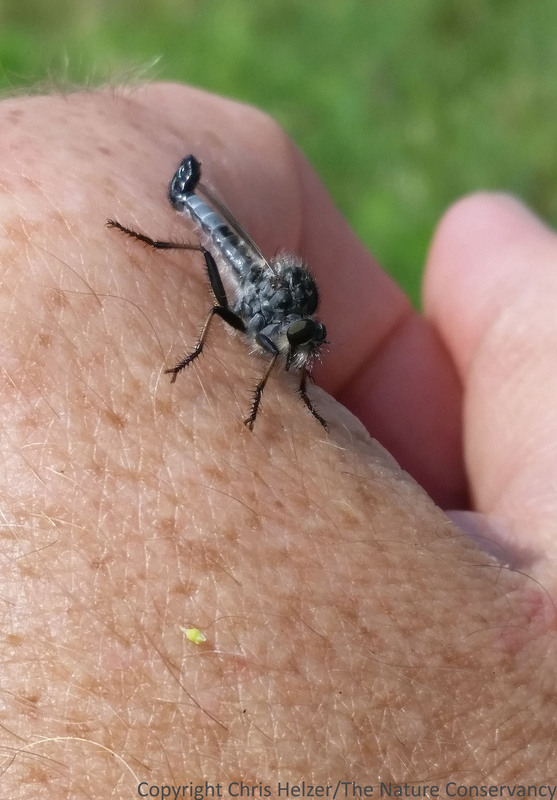 A robber fly on my hand. The Nature Conservancy’s Platte River Prairies, Nebraska. 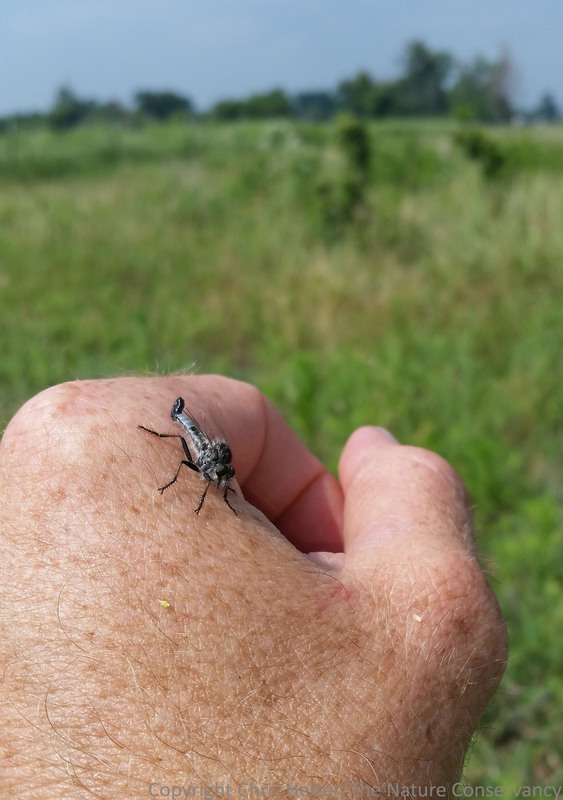 I was finishing some vegetation monitoring last week when a robber fly landed on my hand. Since I didn’t figure it would stay long, I stopped what I was doing and took a closer look. After ten seconds or so, I decided I’d try to take a photo of it, so I carefully pulled my phone out of my pocket (the only camera I had with me) and snapped a couple photos. The fly was still sitting still, so I tried some closer shots and got some decent quality (for a phone) close-up images of the fly. After a couple minutes, I really needed to finish the last couple sampling plots, so I carefully went about that work while trying not to move my left hand faster than necessary. The fly stayed on my hand for about 10 minutes! Just as I finished the last plot and decided to head back to the truck where my actual camera was, the fly apparently decided it had better things to do and took off. The robber fly stuck around long enough for photos. I’m not sure why my little buddy decided to land and hang out on my hand for as long as it did. My previous experience with robber flies is that they are very difficult to get close to, and even more difficult to photograph. This one, however, seemed very comfortable sitting on my hand, even as I moved around and continued my work. For a brief moment, a second robber fly (looked like the same species) landed next to my buddy, but it flew off again almost immediately. If you’re not familiar with robber flies, they are true flies – just like house flies, horse flies and roughly 37,000 other species of flies in North America. They have the short simple antennae, sucking mouthparts, and greatly reduced club-like hind wings that distinguish flies from bees, beetles, bugs, and all other kinds of insects. However, robber flies are predatory, which may not fit your mental image of flies, (though there are actually quite a few different predatory flies). The robber flies I see in our prairies are mostly fuzzy long-bodied predators that often perch on a tall plant, watching for prey to fly past. When they spot a likely target, they dart out after it, capture it (they hope) and return to a perch to eat it. I could come up with all kinds of unrealistic and anthropomorphic reasons the robber fly stayed on my hand for so long, but the truth is that I have no idea. Maybe it just needed a rest, and was too tired to be picky about where it landed (any port in a storm?). If so, I’m sure glad it picked me to hang out with. This entry was posted in Prairie Insects, Prairie Natural History, Prairie Photography and tagged hand, in hand, insect, nebraska, prairie, predator, robber fly by Chris Helzer. Bookmark the permalink. Liz, Robber flies do not bite humans, except defensively, so if you just don’t want one on you, your approach of blowing one off, rather than brushing or slapping and chancing one becoming defensive, is the best. Unfortunately, robber flies look enough like deer flies and horse flies that the average person will think they bite and swat them. But they don’t really behave like them, so if you take just a second to watch them, you might just spare the life of an amazing little insect. I think this robber fly was smart. It knew that you would scare up potential prey and chose its perch wisely. It had probably not come across a human before and did not realize that you have hands and could have smacked it. I typically try not to smack insects that accidentally land on me. However, a few innocents have gotten smacked on accident when I was trying to defend myself from hordes of mosquitoes. …and all you had was a camera phone! Just think what a good photo you’d get with your usual equipment. Honestly, Chris, I have never seen such incredible pictures of insects. I have not yet counted the hairs on their legs and all that other esoteric stuff that entomologists do, but it would probably be easier than with a microscope and actual specimen. Keep these pics coming! So they don’t bite? Horse flies are awful, and folks say their bites tend to get infected. Dog flies are nasty, too — those suckers draw blood!